There are many things one should know when preparing to buy or renovate a house. One of the most crucial decisions you make will be about your roof and shingle options. It is important to choose the right shingle to protect your home according to the climate of our area. 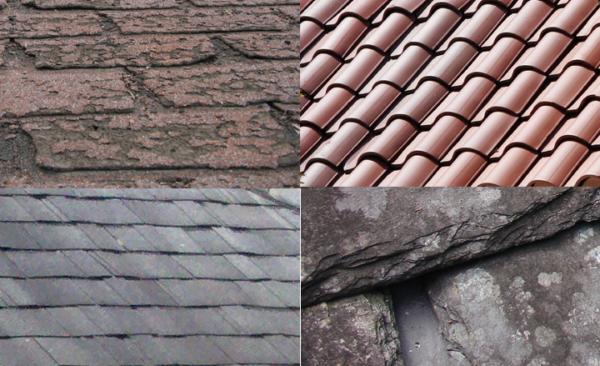 There are a few different types of shingles you may choose to use on your roof. Knowing these options will help you find the right shingle for your home and your budget. The most popular choice in roofing shingles is asphalt shingles. They are relatively inexpensive and there are many different colors and designs to choose. There are even some that are designed to replicate wood, tile and other expensive roofing materials. Asphalt shingles are fairly easy to install making them a popular choice for DIY homeowners. Something to keep in mind is that asphalt shingles do not fair very well in climates with drastic weather. They are easily damaged with high winds and other natural causes. The lifespan on these shingles are 20-30 years due to the thinness of the material. It should be noted that asphalt shingles cannot be used on flat or low slope roofs. They are only used for roofs with a steep slope. Homeowners that are looking to stay green will be happy to know that asphalt shingles can be recycled. Using tile shingles on your roof will give your home the unique characteristic of the Southwest. This take on colonial Spanish architecture offers plenty of variety as the shingles can be molded in to several different shapes. As far as shingle options go, tile shingles are often made in lighter colors, which keep them cool, which is a helpful in hotter climates. Tile shingles can be very heavy and expensive. The National Roofing Contractors Association advises to use caution, as structures may not be able to support the weight of the tiles. Common problems with tile shingles may include cracks and leaks. These can be repaired with roofing cement. Metal roofing can consist of constructed metal shingles or be made of solid metal. These types of shingles are suitable for flat or especially steep rooflines. They are usually made out of less expensive low-galvanized metal but you could also choose other metals such as copper, zinc and aluminum. These types of roofs can also get a little noisy during rain or hailstorms. Some rusting may occur when you use metal shingles. You may need to loosen nails and replace shingles that develop holes or curl up at the seams. Metal shingles can last up to 50 years with good care so maintenance is easy. Though wood shingles are more costly than asphalt, many people find them to be more aesthetically appealing due to their natural features. They are also considered more environmentally friendly than other types of shingles and are known to be durable and energy-efficient. These shingles have a life span of 30-50 years. It should be taken in to consideration that wood shingles are more likely to catch fire than other roofing material. If you decide to use wood shingles be careful to take preventative measures to prevent mold and termites. You should be able to power wash with most mold occurrences. You will need to replace any cracked, warped or missing shingles as the wood is not easy to repair. Wood shingles are tricky to install on your own so be sure to contact a licensed professional roofer. Slate shingles are less common in the Southwest. They tend to be found in the Northeast USA where the slate quarries are located. Slate is extremely durable and a slate roof could last as long as 90 years. It does not absorb water so this material does very well in colder wet climates. These roofs are rarely damaged in storms due to the strength of the slate. The cost of the material can be high and a professional slater would have to be used as many roofing companies do not offer this specific service. Synthetic slate is an option but its lifespan will be shorter. The slate shingles are very heavy to be sure that your structure can handle the weight. Choosing from shingle options is an important to the protection and value of your home. No matter what type of shingle you decide to use, make sure you use a professional and reputable company to do your installation. If you need to replace shingles or need a free consultation to see what type of condition your shingles are in, call Atlas Home Repair at (575) 522-0697 or contact us here.